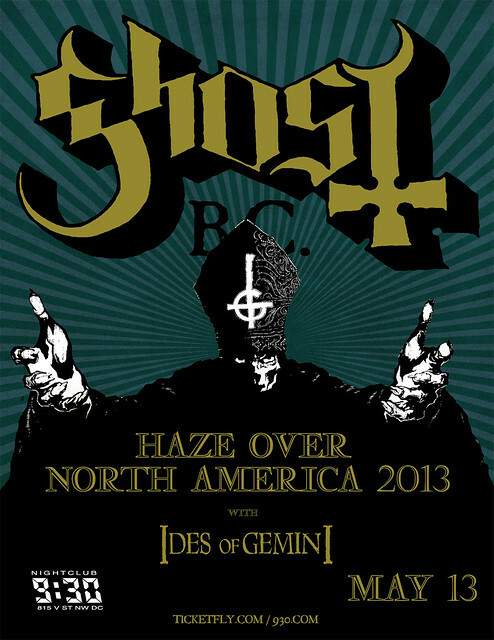 The mysterious Swedish band Ghost BC (they’ve been forced to add the BC for legal reasons) will be performing at the 9:30 Club on Monday, May 13th, 2013, in support of their new album, Infestissumam. Ghost is a very theatrical band live and DCHeavyMetal.com wants to make sure as many of you get to see this show as possible so we’re giving away a pair of tickets to this show! To enter just tell me your favorite Ghost song in the comments section at the end of this post. If you need help, you can see the track listings of their two albums here and here. At 5pm EST on Friday, May 3rd, 2013, the contest will close and a winner will be chosen at random (using Random.org) from all valid entries to get the free pair of tickets to the show. If I don’t hear from the winner within 24 hours then I’ll randomly pick another person to get the tickets. Be sure to enter with a valid email address you check regularly so I can contact you if you win. Don’t worry, I won’t add you to any email lists or anything like that, I hate spam too. If you enter more than once then all of your entries will be disqualified. If the contest is over when you read this or you simply can’t wait to find out if you win the contest you can buy tickets from Ticket Fly for $20 here. Ghost made waves in the metal world when they released their debut album in 2010. Their sound is a throwback to acts of yore such as Blue Oyster Cult and Mercyful Fate. The band is completely anonymous and go on stage wearing costumes and masks that hide their identity. The Nameless Ghouls, as the band members are called, all dress the same except for their front man, Papa Emeritus II. His creepy stage presence is unmistakable and, combined with with Ghost’s music and imagery, conjures the feeling of some kind of evil church service. Their sophomore album was just released in early April and this will be the area’s first chance to see Ghost perform their catchy new material live. The supporting act on this tour is Ides Of Gemini, a haunting rock band from Los Angeles, California. This all adds up to a show that shouldn’t be missed! Now check out these recent Ghost videos below, as well as one from Ides Of Gemini, and enter the contest below! 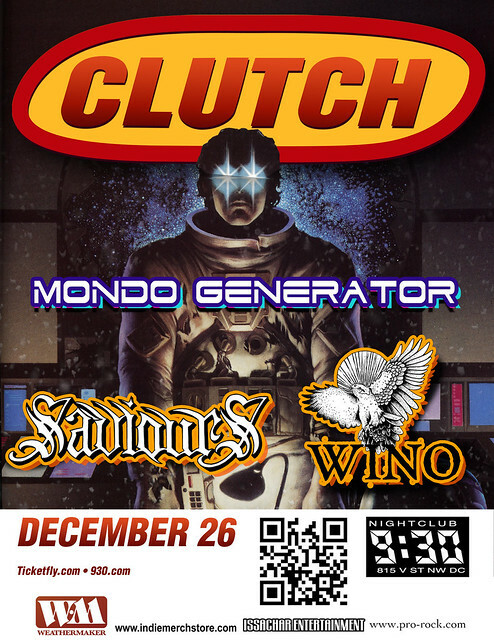 If you’ve been naughty and all you are getting from Santa is switches and coal then you’re in luck: Maryland’s hardest rockers, Clutch, are coming to the 9:30 Club on Wednesday the 26th of December! 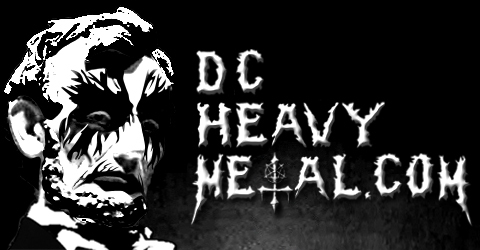 Since this is the season to be giving, DCHeavyMetal.com is going to give away a free pair of tickets to this very concert to a lucky one of you readers. To enter just leave a comment at the bottom of this post telling me why you want to see Clutch at the 9:30 Club. Maybe you want to go because you’ve never seen them live or perhaps you want the chance to hear some new songs from their upcoming album Earth Rocker or maybe you just want a good excuse to get the hell away from visiting relatives. At 5pm EST on Friday, December 14th, 2012, the contest will close and a winner will be chosen at random (using Random.org) from all valid entries to get the free pair of tickets to the show. If I don’t hear from the winner in 24 hours then I’ll randomly pick another person to get the tickets. Please don’t enter if you cannot attend. Be sure to enter with a valid email address you check regularly so I can contact you if you win. Don’t worry, I won’t add you to any email lists or anything like that, I hate spam too. If you enter more than once then all of your entries will be disqualified. If the contest is over when you read this or you simply can’t wait to find out if you win the contest you can buy tickets from Ticket Fly for $29 here. Most of you should be familiar with Clutch’s music even if you don’t have any of their albums. Their music has been featured all over the place (as evidenced here) such as during NFL football highlights on Fox, on the TV show the Walking Dead, in various movies and video games and the Vancouver Canucks even use one of their songs when celebrating a goal being scored! You can bet they’ll be playing a bunch of their classic songs at this show and if we’re lucky we’ll get to hear some new tracks from their upcoming album Earth Rocker as well. 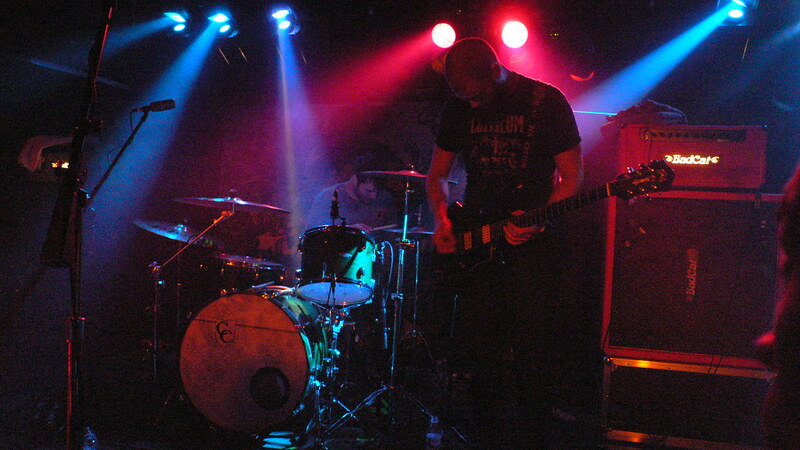 Mondo Generator is a band with close ties to Kyuss and Queens Of The Stone Age, and at various points has featured members of both of those bands. They should be a great support act for this show. Saviours comes from Oakland, California but they’re not an old school thrash throwback by any means. They play some rockin sludge metal and it should be awesome seeing them on the 9:30 Club’s big stage. And be sure to get there early because the opening act is the solo project of Wino, aka Scott Weinrich, who has been a main member of a few bands you may have heard of such as Saint Vitus, The Obsessed, Spirit Caravan and Shrinebuilder. I hear that for this show Dave Sherman will be joining him as well so perhaps we’ll get to hear a couple of Spirit Caravan songs. Now listen to these classic tunes by the four bands playing while you leave a comment to enter the contest. Good luck everyone! 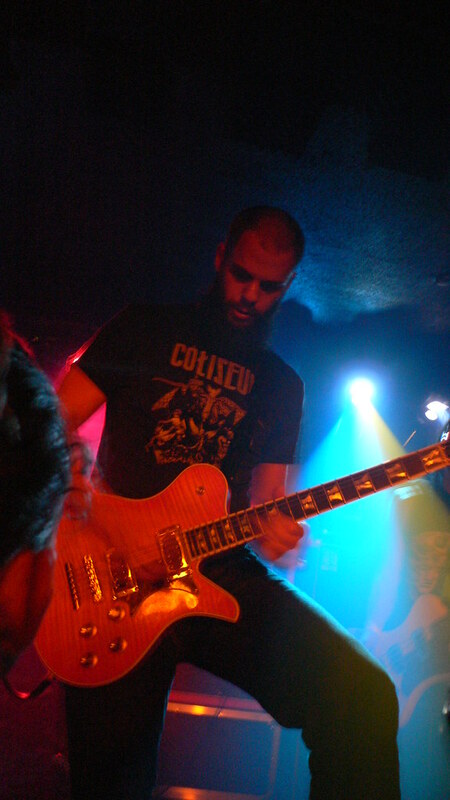 This was the first show of the tour supporting Baroness’ new album, Blue Record. I’m not certain but I’m betting this was the first time those songs were being played live. On the stage they had a cool looking fabric backdrop of the cover art from the new album. Their show started off a bit disorganized, they had some intro song playing, then it stopped, then after several minutes of silence they walked onto the stage and started playing. I noticed the lead guitarist had changed from a St. Vitus shirt to a Dark Castle shirt in this time, for some reason. I really like the energy of a lot of their songs on their new album. I’ve listened to their first one, Red Album, a few times but it has never gripped me as much as these newer songs do. The one thing I don’t like about the new album is all the intros and instrumentals, there’s a lot of them. Unfortunately for me, they play them live too. I guess that’s cool for people who enjoy them, but it’s really just a pause in the energy to me and honestly I don’t find theirs particularly interesting. Their show was pretty loud for a club this size, which is never a bad thing to me. The kick drum was really pounding, though the microphones didn’t seem to work well for the live show. They seemed to be very tight uni-directional microphones, which means if you’re not directly in front of them, you might as well be in the next room. This made the vocals just disappear completely from the mix a few times when the band members were particularly excited on stage. This was especially a problem for the lead guitarist and bass player, who were helping with backing vocals from time to time, since their mics were not as loud in the mix to begin with. The show was pretty good for the most part, they played most of the songs I really wanted to hear. The stage was pretty cramped but they still did a few theatrics to make things interesting. I thought it was kinda cool when the drummer poured water on his cymbals before a big entrance in a song, spraying the water everywhere in a cool visual effect. At the end of the show they did the typical encore thing where they walked off stage and waited a couple minutes to come back and play their final song of the night. I don’t understand why every headliner band seems to feel the need to do this, regardless of genre. It’s not an encore if it’s scripted! Anyways, they did play for almost an hour and a half, which might be a bit long for them. I mean I do enjoy their music, but since they’ve only got 2 full length albums out, they started running out of material to play that’s of the same caliber. This made the show start to drag on a bit for me. I really think these guys are a great up and coming band and I think with some better exposure they would be playing much larger venues. On the other hand, watching concerts at the 9:30 Club has become quite a drag, so I hope they don’t get too big too quick! It was a really fun show and for $12 it was well worth attending. One more thing, if you’re planning on buying the Blue Record on vinyl at the concert, try to do it early. They ran out of copies to sell at this show. They said they were getting more the next day, but who knows how long those will last. I spoke to the bass player, Summer Welch, after the show, and the band seemed to think the vinyl was available on their record label’s website, Relapse.com. I had checked earlier that day and knew it wasn’t, so that means this vinyl is going to sell more than they’re expecting since people can’t buy it anywhere. They were selling all vinyl for $20, all t-shirts for $15 and CDs for $12, cash only of course.